2001-07-27 Assigned to CALIFORNIA INSTITUTE OF TECHNOLOGY reassignment CALIFORNIA INSTITUTE OF TECHNOLOGY ASSIGNMENT OF ASSIGNORS INTEREST (SEE DOCUMENT FOR DETAILS). Assignors: JETHMALANI, JAGDISH M., KORNFIELD, JULIA A., GRUBBS, ROBERT H., SANDSTEDT, CHRISTIAN A. 2002-02-12 Assigned to REGENTS OF THE UNIVERSITY OF CALIFORNIA, THE reassignment REGENTS OF THE UNIVERSITY OF CALIFORNIA, THE ASSIGNMENT OF ASSIGNORS INTEREST (SEE DOCUMENT FOR DETAILS). Assignors: SCHWARTZ, DANIEL M.
2017-10-20 Assigned to CALIFORNIA INSTITUTE OF TECHNOLOGY reassignment CALIFORNIA INSTITUTE OF TECHNOLOGY CORRECTIVE ASSIGNMENT TO CORRECT THE INFORMATION INSIDE THE ASSIGNMENT DOCUMENT PREVIOUSLY RECORDED AT REEL: 012033 FRAME: 0005. ASSIGNOR(S) HEREBY CONFIRMS THE ASSIGNMENT. Assignors: KORNFIELD, JULIA A., GRUBBS, ROBERT H., JETHMALANI, JAGDISH M., SANDSTEDT, CHRISTIAN A. The present invention relates to lenses that are capable of post-fabrication power modifications. In general, the inventive lenses comprise (i) a first polymer matrix and (ii) a refraction modulating composition that is capable of stimulus-induced polymerization dispersed therein. When at least a portion of the lens is exposed to an appropriate stimulus, the refraction modulating composition forms a second polymer matrix. The amount and location of the second polymer matrix may modify a lens characteristic such as lens power by changing its refractive index and/or by altering its shape. The inventive lenses have a number of applications in the electronics and medical fields as data storage means and as medical lenses, particularly intraocular lenses, respectively. This application claims the benefit of (i) U.S. Provisional Application No. 60/115,617 filed Jan. 12, 1999 filed by inventors Jagdish M. Jethinalani, Daniel M. Schwartz, Julie A. Komfield, and Robert H. Grubbs entitled SILICONE IOLS EMBEDDED WITH PHOTOSENSITIVE COMPOSITIONS; (ii) U.S. Provisional Application No. 60/132,871 filed May 5, 1999 filed by inventors Jagdish M. Jethmalani, Daniel M. Schwartz,. Julie A. Komfield, Robert H. Grubbs, and Christian A. Sandstedt entitled SILICONE IOLS EMBEDDED WITH PHOTO-SENSITIVE COMPOSITIONS; and (iii) U.S. Provisional Application No. 60/140,298 filed Jun. 17, 1999 filed by inventors Jagdish M. Jethinalani, Daniel M. Schwartz, Julie A. Komfield, Robert H. Grubbs, and Christian A. Sandstedt entitled SILICONE IOLS EMBEDDED WITH PHOTOSENSITIVE COMPOSITIONS, all three of which are incorporated herein by reference in their entireties. Approximately two million cataract surgery procedures are performed in the United States annually. The procedure generally involves making an incision in the anterior lens capsule to remove the cataractous crystalline lens and implanting an intraocular lens in its place. The power of the implanted lens is selected (based upon pre-operative measurements of ocular length and corneal curvature) to enable the patient to see without additional corrective measures (e.g., glasses or contact lenses). Unfortunately, due to errors in measurement, and/or variable lens positioning and wound healing, about half of all patients undergoing this procedure will not enjoy optimal vision without correction after surgery. Brandser et al., Acta Ophthalmol Scand 75:162-165 (1997); Oshika et al., J cataract Refract Surg 24:509-514 (1998). Because the power of prior art intraocular lenses generally cannot be adjusted once they have been implanted, the patient typically must choose between replacing the implanted lens with another lens of a different power or be resigned to the use of additional corrective lenses such as glasses or contact lenses. Since the benefits typically do not outweigh the risks of the former, it is almost never done. An intraocular lens whose power may be adjusted after implantation and subsequent wound healing would be an ideal solution to post-operative refractive errors associated with cataract surgery. Moreover, such a lens would have wider applications and may be used to correct more typical conditions such as myopia, hyperopia, and astigmatism. Although surgical procedures such as LASIK which uses a laser to reshape the cornea are available, only low to moderate myopia and hyperopia may be readily treated. In contrast, an intraocular lens, which would function just like glasses or contact lenses to correct for the refractive error of the natural eye, could be implanted in the eye of any patient. Because the power of the implanted lens may be adjusted, post-operative refractive errors due to measurement irregularities and/or variable lens positioning and wound healing may be fine tuned in-situ. The present invention relates to optical elements, particularly medical lenses and methods of using the same. In general, the inventive lens comprises (i) a first polymer matrix and (ii) a refraction modulating composition that is capable of stimulus-induced polymerization dispersed therein. In one embodiment, when at least a portion of the lens is exposed to an appropriate stimulus, the refraction modulating composition forms a second polymer matrix, the formation of which modifies lens power. FIG. 1 is a schematic of a lens of the present invention being irradiated in the center followed by irradiation of the entire lens to “lock in” the modified lens power. FIG. 2 illustrates the prism irradiation procedure that is used to quantify the refractive index changes after being exposed to various amounts of irradiation. FIG. 3 shows unfiltered moiré fringe patterns of an inventive IOL. The angle between the two Ronchi rulings was set at 12° and the displacement distance between the first and second moiré patterns was 4.92 mm. FIG. 4 is a Ronchigram of an inventive IOL. The Ronchi pattern corresponds to a 2.6 mm central region of the lens. FIG. 5 is a schematic illustrating a second mechanism whereby the formation of the second polymer matrix modulates a lens property by altering lens shape. FIG. 6 are Ronchi interferograms of an IOL before and after laser treatment depicting approximately a +8.6 diopter change in lens power within the eye. The spacing of alternative light and dark bands is proportional to lens power. The present invention relates to optical elements (e.g., lenses and prisms) that are capable of post-fabrication power modifications. More particularly, the present invention relates to intraocular lenses whose power may be adjusted in-situ after implantation in the eye. The inventive optical elements comprise a first polymer matrix and a refraction modulating composition dispersed therein. The first polymer matrix forms the optical element framework and is generally responsible for many of its material properties. The refraction modulating composition (“RMC”) may be a single compound or a combination of compounds that is capable of stimulus-induced polymerization, preferably photo-polymerization. As used herein, the term “polymerization” refers to a reaction wherein at least one of the components of the refraction modulating composition reacts to form at least one covalent or physical bond with either a like component or with a different component. The identities of the first polymer matrix and the refraction modulating compositions will depend on the end use of the optical element. However, as a general rule, the first polymer matrix and the refraction modulating composition are selected such that the components that comprise the refraction modulating composition are capable of diffusion within the first polymer matrix. Put another way, a loose first polymer matrix will tend to be paired with larger RMC components and a tight first polymer matrix will tend to be paired with smaller RMC components. Upon exposure to an appropriate energy source (e.g., heat or light), the refraction modulating composition typically forms a second polymer matrix in the exposed region of the optical element. The presence of the second polymer matrix changes the material characteristics of this portion of the optical element to modulate its refraction capabilities. In general, the formation of the second polymer matrix typically increases the refractive index of the affected portion of the optical element. After exposure, the refraction modulating composition in the unexposed region will migrate into the exposed region over time. The amount of RMC migration into the exposed region is time dependent and may be precisely controlled. If enough time is permitted, the RMC components will re-equilibrate and redistribute throughout optical element (i.e., the first polymer matrix, including the exposed region). When the region is re-exposed to the energy source, the refraction modulating composition (“RMC”) that has since migrated into the region (which may be less than if the RMC composition were allowed to re-equilibrate) polymerizes to further increase the formation of the second polymer matrix. This process (exposure followed by an appropriate time interval to allow for diffusion) may be repeated until the exposed region of the optical element has reached the desired property (e.g., power, refractive index, or shape). At this point, the entire optical element is exposed to the energy source to “lock-in” the desired lens property by polymerizing the remaining RMC components that are outside the exposed region before the components can migrate into the exposed region. In other words, because freely diffusable RMC components are no longer available, subsequent exposure of the optical element to an energy source cannot further change its power. FIG. 1 illustrates one inventive embodiment, refractive index modulation (thus lens power modulation) followed by a lock in. The first polymer matrix is a covalently or physically linked structure that functions as an optical element and is formed from a first polymer matrix composition (“FPMC”). In general, the first polymer matrix composition comprises one or more monomers that upon polymerization will form the first polymer matrix. The first polymer matrix composition optionally may include any number of formulation auxiliaries that modulate the polymerization reaction or improve any property of the optical element. Illustrative examples of suitable FPMC monomers include acrylics, methacrylates, phosphazenes, siloxanes, vinyls, homopolymers and copolymers thereof. As used herein, a “monomer” refers to any unit (which may itself either be a homopolymer or copolymer) which may be linked together to form a polymer containing repeating units of the same. If the FPMC monomer is a copolymer, it may be comprised of the same type of monomers (e.g., two different siloxanes) or it may be comprised of different types of monomers (e.g., a siloxane and an acrylic). In one embodiment, the one or more monomers that form the first polymer matrix are polymerized and cross-linked in the presence of the refraction modulating composition. In another embodiment, polymeric starting material that forms the first polymer matrix is cross-linked in the presence of the refraction modulating composition. Under either scenario, the RMC components must be compatible with and not appreciably interfere with the formation of the first polymer matrix. Similarly, the formation of the second polymer matrix should also be compatible with the existing first polymer matrix. Put another way, the first polymer matrix and the second polymer matrix should not phase separate and light transmission by the optical element should be unaffected. As described previously, the refraction modulating composition may be a single component or multiple components so long as: (i) it is compatible with the formation of the first polymer matrix; (ii) it remains capable of stimulus-induced polymerization after the formation of the first polymer matrix; and (iii) it is freely diffusable within the first polymer matrix. In preferred embodiments, the stimulus-induced polymerization is photo-induced polymerization. The inventive optical elements have numerous applications in the electronics and data storage industries. Another application for the present invention is as medical lenses, particularly as intraocula lenses. In general, there are two types of intraocular lenses (“IOLs”). The first type of an intraocular lens replaces the eye's natural lens. The most common reason for such a procedure is cataracts. The second type of intraocular lens supplements the existing lens and functions as a permanent corrective lens. This type of lens (sometimes referred to as a phakic intraocular lens) is implanted in the anterior or posterior chamber to correct any refractive errors of the eye. In theory, the power for either type of intraocular lenses required for emmetropia (i.e., perfect focus on the retina from light at infinity) can be precisely calculated. However, in practice, due to errors in measurement of corneal curvature, and/or variable lens positioning and wound healing, it is estimated that only about half of all patients undergoing IOL implantation will enjoy the best possible vision without the need for additional correction after surgery. Because prior art IOLs are generally incapable of post-surgical power modification, the remaining patients must resort to other types of vision correction such as external lenses (e.g., glasses or contact lenses) or cornea surgery. The need for these types of additional corrective measures is obviated with the use of the intraocular lenses of the present invention. The inventive intraocular lens comprises a first polymer matrix and a refraction modulating composition dispersed therein. The first polymer matrix and the refraction modulating composition are as described above with the additional requirement that the resulting lens be biocompatible. Illustrative examples of a suitable first polymer matrix include: poly-acrylates such as poly-alkyl acrylates and poly-hydroxyalkyl acrylates; poly-methacrylates such as poly-methyl methacrylate (“PMMA”), poly-hydroxyethyl methacrylate (“PHEMA”), and poly-hydroxypropyl methacrylate (“HPMA”); poly-vinyls such as poly-styrene and poly-vinylpyrrolidone (“PNVP”); poly-siloxanes such as poly-dimethylsiloxane; poly-phosphazenes, and copolymers of thereof U.S. Pat. No.4,260,725 and patents and references cited therein (which are all incorporated herein by reference) provide more specific examples of suitable polymers that may be used to form the first polymer matrix. In preferred embodiments, the first polymer matrix generally possesses a relatively low glass transition temperature (“Tg”) such that the resulting IOL tends to exhibit fluid-like and/or elastomeric behavior, and is typically formed by crosslinking one or more polymeric starting materials wherein each polymeric starting material includes at least one crosslinkable group. Illustrative examples of suitable crosslinkable groups include but are not limited to hydride, acetoxy, alkoxy, amino, anhydride, aryloxy, carboxy, enoxy, epoxy, halide, isocyano, olefinic, and oxime. In more preferred embodiments, each polymeric starting material includes terminal monomers (also referred to as endcaps) that are either the same or different from the one or more monomers that comprise the polymeric starting material but include at least one crosslinkable group. In other words, the terminal monomers begin and end the polymeric starting material and include at least one crosslinkable group as part of its structure. Although it is not necessary for the practice of the present invention, the mechanism for crosslinking the polymeric starting material preferably is different than the mechanism for the stimulus-induced polymerization of the components that comprise the refraction modulating composition. For example, if the refraction modulating composition is polymerized by photo-induced polymerization, then it is preferred that the polymeric starting materials have crosslinkable groups that are polymerized by any mechanism other than photo-induced polymerization. An especially preferred class of polymeric starting materials for the formation of the first polymer matrix is poly-siloxanes (also known as “silicones”) endcapped with a terminal monomer which includes a crosslinkable group selected from the group consisting of acetoxy, amino, alkoxy, halide, hydroxy, and mercapto. Because silicone IOLs tend to be flexible and foldable, generally smaller incisions may be used during the IOL implantation procedure. An example of an especially preferred polymeric starting material is bis(diacetoxymethylsilyl)-polydimethylsiloxane (which is poly-dimethylsiloxane that is endcapped with a diacetoxymethylsilyl terminal monomer). The refraction modulating composition that is used in fabricating IOLs is as described above except that it has the additional requirement of biocompatibility. The refraction modulating composition is capable of stimulus-induced polymerization and may be a single component or multiple components so long as: (i) it is compatible with the formation of the first polymer matrix; (ii) it remains capable of stimulus-induced polymerization after the formation of the first polymer matrix; and (iii) it is freely diffusable within the first polymer matrix. In general, the same type of monomers that is used to form the first polymer matrix may be used as a component of the refraction modulating composition. However, because of the requirement that the RMC monomers must be diffusable within the first polymer matrix, the RMC monomers generally tend to be smaller (i.e., have lower molecular weights) than the monomers which form the first polymer matrix. In addition to the one or more monomers, the refraction modulating composition may include other components such as initiators and sensitizers that facilitate the formation of the second polymer matrix. In preferred embodiments, the stimulus-induced polymerization is photo-polymerization. In other words, the one or more monomers that comprise the refraction modulating composition each preferably includes at least one group that is capable of photopolymerization. Illustrative examples of such photopolymerizable groups include but are not limited to acrylate, allyloxy, cinnamoyl, methacrylate, stibenyl, and vinyl. In more preferred embodiments, the refraction modulating composition includes a photoinitiator (any compound used to generate free radicals) either alone or in the presence of a sensitizer. Examples of suitable photoinitiators include acetophenones (e.g., a-substituted haloacetophenones, and diethoxyacetophenone); 2,4-dichloromethyl-1,3,5-triazines; benzoin methyl ether; and o-benzoyl oximino ketone. Examples of suitable sensitizers include p-(dialkylamino)aryl aldehyde; N-alkylindolylidene; and bis[p-(dialkylarnino)benzylidene] ketone. R1, R2, R3, and R4 are independently each hydrogen, alkyl (primary, secondary, tertiary, cyclo), aryl, or heteroaryl. In preferred embodiments, R1, R2, R3, and R4 is a C1-C10 alkyl or phenyl. Because RMC monomers with a relatively high aryl content have been found to produce larger changes in the refractive index of the inventive lens, it is generally preferred that at least one of R1, R2, R3, and R4 is an aryl, particularly phenyl. In more preferred embodiments, R1, R2, and R3 are the same and are methyl, ethyl or propyl and R4 is phenyl. Z is a photopolymerizable group. In preferred embodiments, R5 and R6 are independently each a C1-C10 alkyl or phenyl and Z is a photopolymerizable group that includes a moiety selected from the group consisting of acrylate, allyloxy, cinnamoyl, methacrylate, stibenyl, and vinyl. In more preferred embodiments, R5 and R6 is methyl, ethyl, or propyl and Z is a photopolymerizable group that includes an acrylate or methacrylate moiety. wherein X and X1 are the same and R1, R2, R1, and R4 are as defined previously. 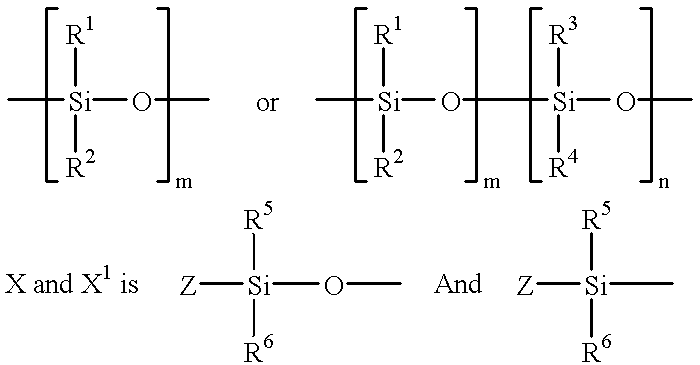 Illustrative examples of such RMC monomers include dimethylsiloxane-diphenylsiloxane copolymer endcapped with a vinyl dimethylsilane group; dimethylsiloxane-methylphenylsiloxane copolymer endcapped with a methacryloxypropyl dimethylsilane group; and dimethylsiloxane endcapped with a methacryloxypropyldimethylsilane group. in the presence of triflic acid wherein R5, R6, and Z are as defined previously. 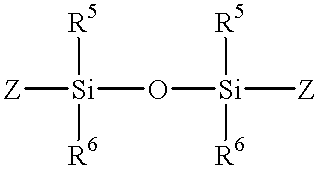 The cyclic siloxane may be a cyclic siloxane monomer, homopolymer, or copolymer. Alternatively, more than one cyclic siloxane may be used. For example, a cyclic dimethylsiloxane tetramer and a cyclic methyl-phenylsiloxane trimer are contacted with bis-methacryloxypropyltetramethyldisiloxane in the presence of triflic acid to form a dimethyl-siloxane methyl-phenylsiloxane copolymer that is endcapped with a methacryloxylpropyl-dimethylsilane group, an especially preferred RMC monomer. removing the optical element from the mold. The type of mold that is used will depend on the optical element being made. For example, if the optical element is a prism, then a mold in the shape of a prism is used. Similarly, if the optical element is an intraocular lens, then an intraocular lens mold is used and so forth. As described previously, the first polymer matrix composition comprises one or more monomers for forming the first polymer matrix and optionally includes any number of formulation auxiliaries that either modulate the polymerization reaction or improve any property (whether or not related to the optical characteristic) of the optical element. Similarly, the refraction modulating composition comprises one or more components that together are capable of stimulus-induced polymerization to form the second polymer matrix. Because flexible and foldable intraocular lenses generally permit smaller incisions, it is preferred that both the first polymer matrix composition and the refraction modulating composition include one or more silicone-based or low Tg acrylic monomers when the inventive method is used to make IOLs. A key advantage of the intraocular lens of the present invention is that an IOL property may be modified after implantation within the eye. For example, any errors in the power calculation due to imperfect corneal measurements and/or variable lens positioning and wound healing may be modified in a post surgical outpatient procedure. (a) exposing at least a portion of the lens to a stimulus whereby the stimulus induces the polymerization of the refraction modulating composition. If after implantation and wound healing, no IOL property needs to be modified, then the exposed portion is the entire lens. The exposure of the entire lens will lock in the then existing properties of the implanted lens. (c) re-exposing the portion of the lens to the stimulus. This procedure generally will induce the further polymerization of the refraction modulating composition within the exposed lens portion. Steps (b) and (c) may be repeated any number of times until the intraocular lens (or optical element) has reached the desired lens characteristic. At this point, the method may further include the step of exposing the entire lens to the stimulus to lock-in the desired lens property. (b) exposing a second portion of the lens to the stimulus. The first lens portion and the second lens portion represent different regions of the lens although they may overlap. Optionally, the method may include an interval of time between the exposures of the first lens portion and the second lens portion. In addition, the method may further comprise re-exposing the first lens portion and/or the second lens portion any number of times (with or without an interval of time between exposures) or may further comprise exposing additional portions of the lens (e.g., a third lens portion, a fourth lens portion, etc.). Once the desired property has been reached, then the method may further include the step of exposing the entire lens to the stimulus to lock-in the desired lens property. In general, the location of the one or more exposed portions will vary depending on the type of refractive error being corrected. For example, in one embodiment, the exposed portion of the IOL is the optical zone which is the center region of the lens (e.g., between about 4 mm and about 5 mm in diameter). Alternatively, the one or more exposed lens portions may be along IOL's outer rim or along a particular meridian. In preferred embodiments, the stimulus is light. In more preferred embodiments, the light is from a laser source. In summary, the present invention relates to a novel optical element that comprises (i) a first polymer matrix and (ii) a refraction modulating composition that is capable of stimulus-induced polymerization dispersed therein. When at least a portion of the optical element is exposed to an appropriate stimulus, the refraction modulating composition forms a second polymer matrix. The amount and location of the second polymer matrix modifies a property such as the power of the optical element by changing its refractive index and/or by altering its shape. Materials comprising various amounts of (a) poly-dimethylsiloxane endcapped with diacetoxymethylsilane (“PDMS”) (36000 g/mol), (b) dimethylsiloxane-diphenylsiloxane copolymer endcapped with vinyl-dimethyl silane (“DMDPS”) (15,500 g/mol), and (c) a UV-photoinitiator, 2,2-dimethoxy-2-phenylacetophenone (“DMPA”) as shown by Table 1 were made and tested. PDMS is the monomer which forms first polymer matrix, and DMDPS and DMPA together comprise the refraction modulating composition. awt % with respect to DMDPS. Briefly, appropriate amounts of PMDS (Gelest DMS-D33; 36000 g/mol), DMDPS (Gelest PDV-0325; 3.0-3.5 mole % diphenyl, 15,500 g/mol), and DMPA (Acros; 1.5 wt % with respect to DMDPS) were weighed together in an aluminum pan, manually mixed at room temperature until the DMPA dissolved, and degassed under pressure (5 mtorr) for 2-4 minutes to remove air bubbles. Photosensitive prisms were fabricated by pouring the resulting silicone composition into a mold made of three glass slides held together by scotch tape in the form of a prism and sealed at one end with silicone caulk. The prisms are ˜5 cm long and the dimensions of the three sides are ˜8 mm each. The PDMS in the prisms was moisture cured and stored in the dark at room temperature for a period of 7 days to ensure that the resulting first polymer matrix was non-tacky, clear, and transparent. The amount of photoinitiator (1.5 wt. %) was based on prior experiments with fixed RMC monomer content of 25% in which the photoinitiator content was varied. Maximal refractive index modulation was observed for compositions containing 1.5% and 2 wt. % photoinitiator while saturation in refractive index occurred at 5 wt. %. As illustrated by Scheme 1, commercially available cyclic dimethylsiloxane tetramer (“D4”), cyclic methylphenylsiloxane trimer (“D3′”) in various ratios were ring-opened by triflic acid and bis-methacryloxylpropyltetramethyldisiloxane (“MPS”) were reacted in a one pot synthesis. U.S. Pat. No. 4,260,725; Kunzler, J. F., Trends in Polymer Science, 4: 52-59 (1996); Kunzler et al. J. Appl. Poly. Sci., 55: 611-619 (1995); and Lai et al., J. Poly. Sci. A. Poly. Chem., 33: 1773-1782 (1995). Briefly, appropriate amounts of MPS, D4, and D3′ were stirred in a vial for 1.5-2 hours. An appropriate amount of triflic acid was added and the resulting mixture was stirred for another 20 hours at room temperature. The reaction mixture was diluted with hexane, neutralized (the acid) by the addition of sodium bicarbonate, and dried by the addition of anhydrous sodium sulfate. After filtration and rotovaporation of hexane, the RMC monomer was purified by further filtration through an activated carbon column. The RMC monomer was dried at 5 mtorr of pressure between 70-80 ° C. for 12-18 hours. The amounts of phenyl, methyl, and endgroup incorporation were calculated from 1H-NMR spectra that were run in deuterated chloroform without internal standard tetramethylsilane (“TMS”). Illustrative examples of chemical shifts for some of the synthesized RMC monomers follows. A 1000 g/mole RMC monomer containing 5.58 mole % phenyl (made by reacting: 4.85 g (12.5 mmole) of MPS; 1.68 g (4.1 mmole) of D3′; 5.98 g (20.2 mmole) of D4; and 108 μl (1.21 mmole) of triflic acid: δ=7.56-7.5 ppm (m, 2H) aromatic, δ=7.32-7.33 ppm (m, 3H) aromatic, δ=6.09 ppm (d, 2H) olefinic, δ=5.53 ppm (d, 2H) olefinic, δ=4.07-4.10 ppm (t, 4H) —O—CH 2CH2CH2—, δ=1.93 ppm (s, 6H) methyl of methacrylate, δ=1.65-1.71 ppm (m, 4H) —O—CH2CH 2CH2—, δ=0.54-0.58 ppm (m, 4H) —O—CH2CH2CH 2—Si, δ=0.29-0.30 ppm (d, 3H), CH 3—Si-Phenyl, δ=0.04-0.08 ppm (s, 50 H) (CH 3)2Si of the backbone. A 2000 g/mole RMC monomer containing 5.26 mole % phenyl (made by reacting: 2.32 g (6.0 mmole) of MPS; 1.94 g (4.7 mmole) of D3′; 7.74 g (26.1 mmole) of D4; and 136 μl (1.54 mmole) of triflic acid: δ=7.54-7.58 ppm (m, 4H) aromatic, δ=7.32-7.34 ppm (m, 6H) aromatic, δ=6.09 ppm (d, 2H) olefinic, δ=5.53 ppm (d, 2H) olefinic, δ=4.08-4.11 ppm (t, 4H) —O—CH 2CH2CH2—, δ=1.94 ppm (s, 6H) methyl of methacrylate, δ=1.67-1.71 ppm (m, 4H) —O—CH2CH 2CH2—, δ=0.54-0.59 ppm (m, 4H) —O—CH2CH2CH 2—Si, δ=0.29-0.31 ppm (m, 6H), CH 3-Si-Phenyl, δ=0.04-0.09 ppm (s, 112H) (CH 3)2Si of the backbone. A 4000 g/mole RMC monomer containing 4.16 mole % phenyl (made by reacting: 1.06 g (2.74 mmole) of MPS; 1.67 g (4.1 mmole) of D3′; 9.28 g (31.3 mmole) of D4; and 157 μl (1.77 mmole) of triflic acid: δ=7.57-7.60 ppm (m, 8H) aromatic, δ=7.32-7.34 ppm (m, 6H) aromatic, δ=6.10 ppm (d, 2H) olefinic, δ=5.54 ppm (d, 2H) olefinic, δ=4.08-4.12 ppm (t, 4H) —O—CHhd 2CH2CH2—, δ=1.94 ppm (s, 6H) methyl of methacrylate, δ=1.65-1.74 ppm (m, 4H) —O—CH2CH 2CH2—, δ=0.55-0.59 ppm (m, 4H) —O—CH2CH 2—Si, δ=0.31 ppm (m, 11H), CH 3-Si-Phenyl, δ=0.07-0.09 ppm (s, 272 H) (CH 3)2Si of the backbone. Similarly, to synthesize dimethylsiloxane polymer without any methylphenylsiloxane units and endcapped with methyacryloxypropyl dimethylsilane, the ratio of D4 to MPS was varied without incorporating D′3. Molecular weights were calculated by 1H-NMR and by gel permeation chromatography (“GPC”). Absolute molecular weights were obtained by universal calibration method using polystyrene and poly(methyl methacrylate) standards. Table 2 shows the characterization of other RMC monomers synthesized by the triflic acid ring opening polymerization. At 10-40 wt %, these RMC monomers of molecular weights 1000 to 4000 g/mol with 3-6.2 mole % phenyl content are completely miscible, biocompatible, and form optically clear prisms and lenses when incorporated in the silicone matrix. RMC monomers with high phenyl content (4-6 mole %) and low molecular weight (1000-4000 g/mol) resulted in increases in refractive index change of 2.5 times and increases in speeds of diffusion of 3.5 to 5.0 times compared to the RMC monomer used in Table 1 (dimethylsiloxane-diphenylsiloxane copolymer endcapped with vinyldimethyl silane (“DMDPS”) (3-3.5 mole % diphenyl content, 15500 g/mol). These RMC monomers were used to make optical elements comprising: (a) poly-dimethylsiloxane endcapped with diacetoxymethylsilane (“PDMS”) (36000 g/mol), (b) dimethylsiloxane methylphenylsiloxane copolymer that is endcapped with a methacryloxylpropyldimethylsilane group, and (c) 2,2-dirnethoxy-2-phenylacetophenone (“DMPA”). Note that component (a) is the monomer that forms the first polymer matrix and components (b) and (c) comprise the refraction modulating composition. An intraocular mold was designed according to well-accepted standards. See e.g., U.S. Pat. Nos. 5,762,836; 5,141,678; and 5,213,825. Briefly, the mold is built around two plano-concave surfaces possessing radii of curvatures of −6.46 mm and/or −12.92 mm, respectively. The resulting lenses are 6.35 mm in diameter and possess a thickness ranging from 0.64 mm, 0.98 mm, or 1.32 mm depending upon the combination of concave lens surfaces used. Using two different radii of curvatures in their three possible combinations and assuming a nominal refractive index of 1.404 for the IOL composition, lenses with pre-irradiation powers of 10.51 D (62.09 D in air), 15.75 D (92.44 in air), and 20.95 D (121.46 D in air) were fabricated. Three IOLs were fabricated with 30 and 10 wt % of RMC monomers B and D incorporated in 60 wt % of the PDMS matrix. After moisture curing of PDMS to form the first polymer matrix, the presence of any free RMC monomer in the aqueous solution was analyzed as follows. Two out of three lenses were irradiated three times for a period of 2 minutes using 340 nm light, while the third was not irradiated at all. One of the irradiated lenses was then locked by exposing the entire lens matrix to radiation. All three lenses were mechanically shaken for 3 days in 1.0 M NaCl solution. The NaCl solutions were then extracted by hexane and analyzed by 1H-NMR. No peaks due to the RMC monomer were observed in the NMR spectrum. These results suggest that the RMC monomers did not leach out of the matrix into the aqueous phase in all three cases. Earlier studies on a vinyl endcapped silicone RMC monomer showed similar results even after being stored in 1.0 M NaCl solution for more than one year. Sterilized, unirradiated and irradiated silicone IOLs (fabricated as described in Example 3) of the present invention and a sterilized commercially available silicone IOL were implanted in albino rabbit eyes. After clinically following the eyes for one week, the rabbits were sacrificed. The extracted eyes were enucleated, placed in formalin and studied histopathologically. There is no evidence of corneal toxicity, anterior segment inflammation, or other signs of lens toxicity. Because of the ease of measuring refractive index change (An) and percent net refractive index change (% Δn) of prisms, the inventive formulations were molded into prisms for irradiation and characterization. Prisms were fabricated by mixing and pouring (a) 90-60 wt % of high Mn PDMS, (b) 10-40 wt % of RMC monomers in Table 2, and (c) 0.75 wt % (with respect to the RMC monomers) of the photoinitiator DMPA into glass molds in the form of prisms 5 cm long and 8.0 mm on each side. The silicone composition in the prisms was moisture cured and stored in the dark at room temperature for a period of 7 days to ensure that the final matrix was non-tacky, clear and transparent. Two of the long sides of each prism were covered by a black background while the third was covered by a photomask made of an aluminum plate with rectangular windows (2.5 mm×10 mm). Each prism was exposed to a flux of 1.2 mW/cm2 of a collimated 340 nm light (peak absorption of the photoinitiator) from a 1000 W Xe:Hg arc lamp for various time periods. The ANSI guidelines indicate that the maximum permissible exposure (“MPE”) at the retina using 340 nm light for a 10-30000 s exposure is 1000 mJ/cm2. Criteria for Exposure of Eye and Skin. American National Standard Z136.1: 31-42 (1993). The single dose intensity 1.2 mW/cm2 of 340 nm light for a period of 2 minutes corresponds to 144 mJ/cm2 which is well within the ANSI guidelines. In fact, even the overall intensity for three exposures (432 mJ/cm2) is well within the ANSI guidelines. FIG. 2 is an illustration of the prism irradiation procedure. The prisms were subject to both (i) continuous irradiation—one-time exposure for a known time period, and (ii) “staccato” irradiation—three shorter exposures with long intervals between them. During continuous irradiation, the refractive index contrast is dependent on the crosslinking density and the mole % phenyl groups, while in the interrupted irradiation, RMC monomer diffusion and further crosslinking also play an important role. During staccato irradiation, the RMC monomer polymerization depends on the rate of propagation during each exposure and the extent of interdiffusion of free RMC monomer during the intervals between exposures. Typical values for the diffusion coefficient of oligomers (similar to the 1000 g/mole RMC monomers used in the practice of the present invention) in a silicone matrix are on the order of 10−6 to 10−7 cm2/s. In other words, the inventive RMC monomers require approximately 2.8 to 28 hours to diffuse 1 mm (roughly the half width of the irradiated bands). The distance of a typical optical zone in an IOL is about 4 to about 5 mm across. However, the distance of the optical zone may also be outside of this range. After the appropriate exposures, the prisms were irradiated without the photomask (thus exposing the entire matrix) for 6 minutes using a medium pressure mercury-arc lamp. This polymerized the remaining silicone RMC monomers and thus “locked” the refractive index of the prism in place. Notably, the combined total irradiation of the localized exposures and the “lock-in” exposure was still within ANSI guidelines. Inventive prisms fabricated from RMC monomers described by Table 2 were masked and initially exposed for 0.5, 1, 2, 5, and 10 minutes using 1.2 mW/cm2 of the 340 nm line from a 1000 W Xe:Hg arc lamp. The exposed regions of the prisms were marked, the mask detached and the refractive index changes measured. The refractive index modulation of the prisms was measured by observing the deflection of a sheet of laser light passed through the prism. The difference in deflection of the beam passing through the exposed and unexposed regions was used to quantify the refractive index change (Δn) and the percentage change in the refractive index (% Δn). After three hours, the prisms were remasked with the windows overlapping with the previously exposed regions and irradiated for a second time for 0.5, 1, 2, and 5 minutes (total time thus equaled 1, 2, 4, and 10 minutes respectively). The masks were detached and the refractive index changes measured. After another three hours, the prisms were exposed a third time for 0.5, 1, and 2 minutes (total time thus equaled 1.5, 3, and 6 minutes) and the refractive index changes were measured. As expected, the % Δn increased with exposure time for each prism after each exposure resulting in prototypical dose response curves. Based upon these results, adequate RMC monomer diffusion appears to occur in about 3 hours for 1000 g/mole RMC monomer. All of the RMC monomers (B-F) except for RMC monomer A resulted in optically clear and transparent prisms before and after their respective exposures. For example, the largest % Δn for RMC monomers B, C, and D at 40 wt % incorporation into 60 wt % FPMC were 0.52%, 0.63% and 0.30% respectively which corresponded to 6 minutes of total exposure (three exposures of 2 minutes each separated by 3 hour intervals for RMC monomer B and 3 days for RMC monomers C and D). However, although it produced the largest change in refractive index (0.95%), the prism fabricated from RMC monomer A (also at 40 wt % incorporation into 60 wt % FPMC and 6 minutes of total exposure—three exposures of 2 minutes each separated by 3 hour intervals) turned somewhat cloudy. Thus, if RMC monomer A were used to fabricate an IOL, then the RMC must include less than 40 wt % of RMC monomer A or the % Δn must be kept below the point where the optical clarity of the material is compromised. A comparison between the continuous and staccato irradiation for RMC A and C in the prisms shows that lower % Δn values occurs in prisms exposed to continuous irradiation as compared to those observed using staccato irradiations. As indicated by these results, the time interval between exposures (which is related to the amount of RMC diffusion from the unexposed to exposed regions) may be exploited to precisely modulate the refractive index of any material made from the inventive polymer compositions. Exposure of the entire, previously irradiated prisms to a medium pressure Hg arc lamp polymerized any remaining free RMC, effectively locking the refractive index contrast. Measurement of the refractive index change before and after photolocking indicated no further modulation in the refractive index. Talbot interferometry and the Ronchi test were used to qualitatively and quantitatively measure any primary optical aberrations (primary spherical, coma, astigmatism, field curvature, and distortion) present in pre- and post-irradiated lenses as well as quantifying changes in power upon photopolymerization. In Talbot interferometry, the test IOL is positioned between the two Ronchi rulings with the second grating placed outside the focus of the IOL and rotated at a known angle, θ, with respect to the first grating. Superposition of the autoimage of the first Ronchi ruling (p1=300 lines/inch) onto the second grating (P2=150 lines/inch) produces moiré fringes inclined at an angle, α1. A second moiré fringe pattern is constructed by axial displacement of the second Ronchi ruling along the optic axis a known distance, d, from the test lens. Displacement of the second grating allows the autoimage of the first Ronchi ruling to increase in magnification causing the observed moiré fringe pattern to rotate to a new angle, α2. Knowledge of moiré pitch angles permits determination of the focal length of the lens (or inversely its power) through the expression: f = p 1 p 2  d  ( 1 tan   α 2  sin   θ + cos   θ - 1 tan   α 1  sin   θ + cos   θ ) - 1 . To illustrate the applicability of Talbot interferometry to this work, moiré fringe patterns of one of the inventive, pre-irradiated IOLs (60 wt % PDMS, 30 wt % RMC monomer B, wt % RMC monomer D, and 0.75% DMPA relative to the two RMC monomers) measured in air is presented in FIG. 3. Each of the moiré fringes was fitted with a least squares fitting algorithm specifically designed for the processing of moire patterns. The angle between the two Ronchi rulings was set at 12°, the displacement between the second Ronchi ruling between the first and second moiré fringe patterns was 4.92 mm, and the pitch angles of the moiré fringes, measured relative to an orthogonal coordinate system defined by the optic axis of the instrument and crossing the two Ronchi rulings at 90°, were α1, =−33.2°±0.30° and α2=−52.7°±0.40°. Substitution of these above equation results in a focal length of 10.71±0.50 mm (power=93.77±4.6 D). Optical aberrations of the inventive IOLs (from either fabrication or from the stimulus-induced polymerization of the RMC components) were monitored using the “Ronchi Test” which involves removing the second Ronchi ruling from the Talbot interferometer and observing the magnified autoimage of the first Ronchi ruling after passage though the test IOL. The aberrations of the test lens manifest themselves by the geometric distortion of the fringe system (produced by the Ronchi ruling) when viewed in the image plane. A knowledge of the distorted image reveals the aberration of the lens. In general, the inventive fabricated lenses (both pre and post irradiation treatments) exhibited sharp, parallel, periodic spacing of the interference fringes indicating an absence of the majority of primary-order optical aberrations, high optical surface quality, homogeneity of n in the bulk, and constant lens power. FIG. 4 is an illustrative example of a Ronchigram of an inventive, pre-irradiated IOL that was fabricated from 60 wt % PDMS, 30 wt % RMC monomer B, 10 wt % RMC monomer D, and 0.75% of DMPA relative to the 2 RMC monomers. wherein PV is the power of the lens expressed in diopters, L is the distance from the lens to the observing plane, ds, is the magnified fringe spacing of the first Ronchi ruling, and d is the original grating spacing. An inventive IOL was fabricated as described by Example 3 comprising 60 wt % PDMS (nD=1.404), 30 wt % of RMC monomer B (nD=1.4319), 10 wt % of RMC monomer D (nD=1.4243), and 0.75 wt % of the photoinitiator DMPA relative to the combined weight percents of the two RMC monomers. The IOL was fitted with a 1 mm diameter photomask and exposed to 1.2 mW/cm2 of 340 nm collimated light from a 1000 W Xe:Hg arc lamp for two minutes. The irradiated lens was then placed in the dark for three hours to permit polymerization and RMC monomer diffusion. The IOL was photolocked by continuously exposing the entire for six minutes using the aforementioned light conditions. Measurement of the moire pitch angles followed by substitution into equation 1 resulted in a power of 95.1±2.9 D (f=10.52±0.32 mm) and 104.1±3.6 D (f=9.61 mm±0.32 mm) for the unirradiated and irradiated zones, respectively. The magnitude of the power increase was more than what was predicted from the prism experiments where a 0.6% increase in the refractive index was routinely achieved. If a similar increase in the refractive index was achieved in the IOL, then the expected change in the refractive index would be 1.4144 to 1.4229. Using the new refractive index (1.4229) in the calculation of the lens power (in air) and assuming the dimensions of the lens did not change upon photopolymerization, a lens power of 96.71 D (f=10.34 mm) was calculated. Since this value is less than the observed power of 104.1±3.6 D, the additional increase in power must be from another mechanism. Further study of the photopolymerized IOL showed that subsequent RMC monomer diffusion after the initial radiation exposure leads to changes in the radius of curvature of the lens. See e.g., FIG. 5. The RMC monomer migration from the unradiated zone into the radiated zone causes either or both of anterior and posterior surfaces of the lens to swell thus changing the radius of curvature of the lens. It has been determined that a 7% decrease in the radius of curvature for both surfaces is sufficient to explain the observed increase in lens power. The concomitant change in the radius of curvature was further studied. An identical IOL described above was fabricated. A Ronchi interferogram of the IOL is shown in FIG. 6a (left interferogram). Using a Talbot interferometer, the focal length of the lens was experimentally determined to be 10.52±0.30 mm (95.1±2.8 D). The IOL was then fitted with a Inmm photomask and irradiated with 1.2 mW/cm2 of 340 collimated light from a 1000 W Xe:Hg arc lamp continuously for 2.5 minutes. Unlike the previous IOL, this lens was not “locked in” three hours after irradiation. FIG. 6b (right interferogram) is the Ronchi interferogram of the lens taken six days after irradiation. The most obvious feature between the two interference patterns is the dramatic increase in the fringe spacing, which is indicative of an increase in the refractive power of the lens. Measurement of the fringe spacings indicates an increase of approximately +38 diopters in air (f≈7.5 mm). This corresponds to a change in the order of approximately +8.6 diopters in the eye. Since most post-operative corrections from cataract surgery are within 2 diopters, this experiment indicates that the use of the inventive IOLS will permit a relatively large therapeutic window. Inventive IOLs containing non-phenyl containing RMC monomers were fabricated to further study the swelling from the formation of the second polymer matrix. An illustrative example of such an IOL was fabricated from 60 wt % PDMS, 30 wt % RMC monomer E, 10 wt % RMC monomer F, and 0.75% DMPA relative to the two RMC monomers. The pre-irradiation focal length of the resulting IOL was 10.76 mm (92.94±2.21 D). In this experiment, the light source was a 325 nm laser line from a He:Cd laser. A 1 mm diameter photomask was placed over the lens and exposed to a collimated flux of 0.75 mW/cm2 at 325 nm for a period of two minutes. The lens was then placed in the dark for three hours. Experimental measurements indicated that the focal length of the IOL changed from 10.76 mm±0.25 mm (92.94 D±2.21 D) to 8.07 mm±0.74 mm (123.92 D±10.59 D) or a dioptric change of +30.98 D±10.82 D in air. This corresponds to an approximate change of +6.68 D in the eye. The amount of irradiation required to induce these changes is only 0.09 J/cm2, a value well under the ANSI maximum permissible exposure (“MPE”) level of 1.0 J/cm2. The optical power and quality of the inventive IOLs were monitored to show that handling and ambient light conditions do not produce any unwanted changes in lens power. A 1 mm open diameter photomask was placed over the central region of an inventive IOL (containing 60 wt % PDMS, 30 wt % RMC monomer E, 10 wt % RMC momnomer F, and 0.75 wt % DMPA relative to the two RMC monomers), exposed to continuous room light for a period of 96 hours, and the spatial frequency of the Ronchi patterns as well as the moiré fringe angles were monitored every 24 hours. Using the method of moiré fringes, the focal length measured in the air of the lens immediately after removal from the lens mold is 10.87±0.23 mm (92.00 D±1.98 D) and after 96 hours apf exposure to ambient room light is 10.74 mm±0.25 =mm (93.11 D±2.22 D). Thus, within the experimental uncertainty of the measurement, it is shown that ambient light does not induce any unwanted change in power. A comparison of the resulting Ronchi patterns showed no change in spatial frequency or quality of the interference pattern, confirming that exposure to room light does not affect the power or quality of the inventive IOLs. An inventive IOL whose power had been modulated by irradiation was tested to see if the lock-in procedure resulted in further modification of lens power. An IOL fabricated from 60 wt % PDMS, 30 wt % RMC monomer E, 10 wt % RMC monomer F, and 0.75% DMPA relative to the two RMC monomers was irradiated for two minutes with 0.75 mW/cm2 of the 325 nm laser line from a He:Cd laser and was exposed for eight minutes to a medium pressure Hg arc lamp. Comparisons of the Talbot images before and after the lock in procedure showed that the lens power remained unchanged. The sharp contrast of the interference fringes indicated that the optical quality of the inventive lens also remained unaffected. To determine if the lock-procedure was complete, the IOL was refitted with a 1 mm diameter photomask and exposed a second time to 0.75 mW/cm2 of the 325 laser line for two minutes. As before, no observable change in fringe space or in optical quality of the lens was observed. A situation may arise wherein the implanted IOL does not require post-operative power modification. in such cases, the IOL must be locked in so that its characteristic will not be subject to change. To determine if the lock-in procedure induces undesired changes in the refractive power of a previously unirradiated IOL, the inventive IOL (containing 60 wt % PDMS, 30 wt % RMC monomer E, 10 wt % RMC monomer F, and 0.75 wt % DMPA relative to the two RMC monomers) was subject to three 2 minute irradiations over its entire area that was separated by a 3 hour interval using 0.75 mW/cm2 of the 325 laser line from a He:Cd laser. Ronchigramns and moiré fringe patterns were taken prior to and after each subsequent irradiation. The moiré fringe patterns taken of the inventive IOL in air immediately after removal from the lens mold and after the third 2 minute irradiation indicate a focal length of 10.50 mm±0.39 mm (95.24 D±3.69 D) and 10.12 mm±0.39 mm (93.28 D±3.53D) respectively. These measurements indicate that photolocking a previously unexposed lens does not induce unwanted changes in power. In addition, no discernable change in fringe spacing or quality of the Ronchi fringes was detected indicating that the refractive power had not changed due to the lock-in. a refraction modulating composition dispersed therein, wherein the refraction modulating composition is capable of stimulus-induced polymerization, such that a stimulus causes a desired change of refraction, without subsequent removal of the refraction modulating composition. 2. The optical element as in claim 1 wherein the refraction modulating composition is capable of photo-induced polymerization. 3. The optical element as in claim 1 wherein the optical element is a prism. 4. The optical element as in claim 1 wherein the optical element is a lens. a refraction modulating composition dispersed therein, wherein the refraction modulating composition is capable of photo-induced polymerization, such that light causes a desired change of refraction, without subsequent removal of the refraction modulating composition. 6. The lens as in claim 5 wherein the first polymer matrix is selected from the group consisting of poly-acrylate, poly-methacrylate, poly-vinyl, poly-siloxane, and poly-phosphazene. 7. The lens as in claim 6 wherein the first polymer matrix includes a poly-siloxane. 8. The lens as in claim 6 wherein the first polymer matrix includes a poly-acrylate. 9. The lens of claim 5 wherein the refraction modulating composition includes a component selected from the group consisting of an actylate, methacrylate, vinyl, siloxane and phosphazene. Z is includes a moiety selected from the group consisting of acrylate, allyloxy, cinnamoyl, methacrylate, cinnamoyl, stibenyl, and vinyl. 12. The lens as in claim 11 wherein R1, R2, and R3, R5, and R6 are selected from the group consisting of methyl, ethyl and propyl and R4 is phenyl. encapped with a methacryloxypropyldimethylsilane group and the photoinitiator is 2,2-dimethoxy-2-phenylacetophenone. a polysiloxane matrix and a refraction modulating composition dispersed therein, wherein the refraction modulating composition is capable of photo-induced polymerization, such that light causes a desired change of refraction, without subsequent removal of the refraction modulating composition. 15. The intraocular lens as in claim 14 wherein the polysiloxane matrix is polydimethyl siloxane endcapped with diacetoxymethylsilane. (a) exposing at least a portion of the optical element to a stimulus whereby the stimulus induces the polymerization of the refraction modulating composition, such that the stimulus causes a desired change of refraction, without subsequent removal of the refraction modulating composition. 18. The method as in claim 17 wherein the optical element is a prism or a lens. 19. The method as in claim 17 wherein the exposed portion represents the entire optical element. (c) re-exposing the portion of the optical element to the stimulus to induce the further polymerization of the refraction modulating composition within said portion, such that the stimulus produces a desired change of refraction, without subsequent removal of the refraction modulating composition. 21. The method as in claim 20 further comprising repeating steps (b) and (c). 22. The method of claim 20 or 21 further comprising exposing the entire optical element to the stimulus. (a) exposing at least a portion of the lens to a light source whereby the light source induces the polymerization of the refraction modulating composition, such that stimulus from the light source causes a desired change of refraction, without subsequent removal of the refraction modulating composition. 24. The method as in claim 23 wherein the exposed portion represents the entire intraocular lens. (c) re-exposing the portion of the lens to the light source to induce the further polymerization of the refraction modulating composition within said portion, such that the light produces a desired change of refraction, without subsequent removal of the refraction modulating composition. 26. The method as in claim 25 further comprising repeating steps (b) and (c). 27. The method of claim 25 or 26 further comprising exposing the entire lens to the light source. 28. The method as in claim 23 wherein the exposed portion is the optical zone of the lens. 29. The method as in claim 23 wherein the exposed portion is the outer rim of the lens. 30. The method as in claim 23 wherein the exposed portion is along a meridian of the lens. (c) producing the desired change without subsequent removal of the refraction modulating composition. 32. The method as in claim 31 further comprising exposing a third portion of the lens to light whereby the light induces polymerization of the refraction modulating composition such that the light causes a desired change of refraction, without subsequent removal of the refraction modulating composition. 33. The method as in claim 31 further comprising exposing the entire lens to the light source. a refraction modulating composition dispersed in said lens wherein said refraction modulating composition is capable of stimulus-induced polymerization and is freely diffusable within at least a portion of the lens, such that a stimulus causes a desired change of refraction, without subsequent removal of the refraction modulating composition. 35. The lens of claim 34 further comprising a first polymer matrix. 36. The lens of claim 35 wherein said refraction modulating composition is capable of forming a second polymer matrix. 37. The lens of claim 35 wherein said first polymer matrix is selected from the group consisting of polyacrylate, polymethacrylate, polyvinyl, polysiloxane, and polyphosphazene. 38. The lens of claim 35 wherein the first polymer matrix includes a polysiloxane. 39. The lens of claim 35 wherein the first polymer matrix includes a polyacrylate. 40. The lens of claim 35 wherein said first polymer matrix is formed from polydimethylsiloxane endcapped with diacetoxymetylsilane. 41. The lens of claim 34 wherein the refraction modulating composition is capable of photo-induced polymerization. 42. The lens of claim 34 wherein the lens is an intraocular lens. 43. The lens of claim 34 wherein said refraction modulating composition is biocompatible. 44. The lens of claim 34 further comprising a photoinitiator. 45. The lens of claim 34 wherein said refraction modulating composition includes a component selected from the group consisting of an acrylate, methacrylate, vinyl, siloxane, and phosphazene. respectively, wherein m and n are independently an integer and R1, R2, R3, R4, R5, and R6 are each independently selected from the group consisting of hydrogen, alkyl, aryl and heteroaryl and Z is a photo-polymerizable group. 47. The lens of claim 46 wherein R1, R2, R3, R4, R5 and R6 are each independently a C1-C10 alkyl or phenyl and Z includes a moiety selected from the group consisting of acrylate, methacrylate, allyloxy, cinnamoyl, stibenyl, and vinyl. 48. The lens of claim 46 wherein R1, R2, R3, R5 and R6 are selected from the group consisting of methyl, ethyl and propyl and R4 is phenyl. 49. The lens of claim 46 wherein the momnomer is (i) dimethylsiloxane-diphenylsiloxane copolymer endcapped with a vinyldimethylsilane group, (ii) dimethylsiloxane-methylphenylsiloxane copolymer endcapped with a methacryloxypropyldimethylsilane group, or (iii) dimethylsiloxane endcapped with a methacryloxypropyldimethylsilane group. 50. The lens of claim 34 wherein said refraction modulating composition comprises dimethylsiloxane-methylphenylsiloxane copolymer endcapped with methacryloxypropyidimethylsilane. a refraction modulating composition dispersed in said first polymer matrix wherein said refraction modulating composition is capable of stimulus-induced polymerization and is freely diffusable within at least a portion of the lens, such that a stimulus causes a desired change of refraction, without subsequent removal of the refraction modulating composition. 52. The lens of claim 51 wherein said refraction modulating composition is capable of photo-induced polymerization. 53. The lens of claim 51 wherein said refraction modulating composition is capable of forming a second polymer matrix. 54. The lens of claim 51 wherein the lens is an intraocular lens. 55. The lens of claim 51 wherein said refraction modulating composition is biocompatible. 56. The lens of claim 51 further comprising a photoinitiator. 57. The lens of claim 51 wherein said refraction modulating composition includes a component selected from the group consisting of an acrylate, methacrylate, vinyl, siloxane, and phosphazene. 58. The lens of claim 51 wherein said first polymer matrix is selected from the group consisting of polyacrylate, polymethacrylate, polyvinyl, polysiloxane, and polyphosphazene. 60. The lens of claim 59 wherein R1, R2, R3, R4, R5 and R6 are each independently a C1-C10 alkyl or phenyl and Z includes a moiety selected from the group consisting of acrylate, methacrylate, allyloxy, cinnamoyl, stibenyl, and vinyl. 61. The lens of claim 51 wherein the first polymer matrix includes a polysiloxane. 62. The lens of claim 51 wherein the first polymer matrix includes a polyacrylate. 63. The lens of claim 51 wherein the polysiloxane matrix is polydimethylsiloxane endcapped with diacetoxymethylsilane. 64. The lens of claim 51 wherein the refraction modulating composition comprises (i) dimethylsiloxane-diphenylsiloxane copolymer endcapped with a vinyl dimethylsilane group, (ii) dimethylsiloxane-methylphenylsiloxane copolymer endcapped with a methacryloxypropyldimethylsilane group, or (iii) dimethylsiloxane endcapped with a methacryloxypropyldimethylsilane group. a refraction modulating composition dispersed in said first polymer matrix wherein said refraction modulating composition is capable of stimulus-induced polymerization and is freely diffusable within at least a portion of said first polymer matrix, such that a stimulus causes a desired change of refraction, without subsequent removal of the refraction modulating composition. 66. The intraocular lens of claim 65 wherein said refraction modulating composition is capable of forming a second polymer matrix. 67. The intraocular lens of claim 65 wherein said refraction modulating composition is capable of photo-induced polymerization. 68. The intraocular lens of claim 65 wherein said refraction modulating composition is biocompatible. 69. The intraocular lens of claim 65 further comprising a photoinitiator. 70. The intraocular lens of claim 65 wherein said refraction modulating composition includes a component selected from the group consisting of an acrylate, methacrylate, vinyl, siloxane, and phosphazene. 71. The intraocular lens of claim 65 wherein said first polymer matrix is selected from the group consisting of polyacrylate, polymethacrylate, polyvinyl, polysiloxane, and polyphosphazene. 73. The intraocular lens of claim 65 wherein the first polymer matrix includes a polysiloxane. 74. The lens of claim 72 wherein R1, R2, R3, R4, R5 and R6 are each independently a C1-C10 alkyl or phenyl and Z includes a moiety selected from the group consisting of acrylate, methacrylate, allyloxy, cinnamoyl, stibenyl, and vinyl. 75. The intraocular lens of claim 65 wherein the first polymer matrix includes a polyacrylate. 76. The intraocular lens of claim 65 wherein said first polymer matrix is formed from poly-dimethylsiloxane endcapped with diacetoxymethylsilane. 77. The intraocular lens of claim 65 wherein said refraction modulating composition comprises dimethylsiloxane-methylphenylsiloxane copolymer endcapped with methacryloxypropyldimethylsilane. 78. A method of adjusting the refraction of a lens having a refraction modulating composition dispersed therein, comprising (a) exposing at least a portion of the lens to an external stimulus wherein the external stimulus induces the polymerization of the refraction modulating composition in the portion of the lens exposed to the stimulus, such that the stimulus causes a desired change of refraction, without subsequent removal of the refraction modulating composition. 79. The method of claim 78 further comprising (b) waiting an interval of time; and (c) exposing a portion of the lens to the stimulus to induce further polymerization of the refraction modulating composition, such that the stimulus causes a desired change of refraction, without subsequent removal of the refraction modulating composition. 80. The method of claim 79 further comprising repeating the steps (b) and (c). 81. The method of claim 79 or 80 further comprising exposing the entire lens to the stimulus. 82. The method of claim 79 wherein said external stimulus is light. 83. The method of claim 79 wherein said external stimulus is ultraviolet light. MXPA01007051A MXPA01007051A (en) 1999-01-12 1999-10-13 Lenses capable of post-fabrication power modification. MX2007015856A (en) * 2005-06-13 2008-02-22 Alcon Inc Ophthalmic and otorhinolaryngological device materials. FR2661914B1 (en) * 1990-05-11 1994-05-06 Essilor Internal Cie Gle Optique Method for producing a transparent polymer lens has refractive index module. FR2683918B1 (en) * 1991-11-19 1994-09-09 Thomson Csf Material constitutes an optical sight and weapon using this window. "Criteria for Exposure of Eye and Skin," American National Standard, Z136.1, 1933, 31-42. Allen et al., Synthesis, photopolymerization and photochemistry of novel polysiloxane photoinitiators; J. Photochem. Photobiol. A: Chem. ; 1991; pp. 125-139; vol. 62; Elsevier Sequoia, Lausanne. Apple et al., Irreversible Silicone Oil Adhesion to Silicone Intraocular Lenses -A clinicopathologic analysis; Opthalmology; Oct. 1996; pp. 1555-1562; vol. 103; No. 10. Baltus, R.E., et al., "Solubility and Diffusivity of Cyclic Oligomers in Poly(dimethylsiloxane) Using Capillary Column Inverse Gas Chromatography," Am. Chem Soc., 1993, 26, pp. 5651-5656. Barakat, R., "General Diffraction Theory of Optical Aberration Tests, from the Point of View of Spatial Filtering," Journal of the Optical Society of America, vol. 59, No. 11, Nov. 1969, pp. 1432-1439. Bennet, A.G. ; Francis, J.L., "Ametropia and Its Correction," Chapter 9, pp. 133-181. Brandser et al., Accuracy of IOL calculation in cataract surgery; Acta Opthalmologica Scandinavica; 1997; pp. 162-165; vol. 75; vol. 75; No. 2. Bräuchle et al., Holographic Spectroscopy and Holographic Information Recording in Polymer Matrices; Lasers in Polymer Science and Technology: Applications; 1990; pp. 181-209; vol. III, Ed. Jean-Pierre Fouassier, Jan F. Rabek, CRC Press. Canabal, H.; Quiroga, J.A. ; Bernabeu, E., "Automatic processing in moiré deflectometry by local fringe direction calculation," Applied Optics 1998; 37 (25) pp. 5894-5901. Chang, Chon-Wen, et al., "An Improved Technique of Measuring the Focal Length of a Lens," Optic Communivations, vol. 73, No. 4, Oct. 1989, pp. 257-262. Cornejo, A.; Malacara, D., "Ronchi Test of Aspherical Surfaces, Analysis, and Accuracy," Applied Optics, 1970; 9(8), pp. 1897-1901. Cornejo-Rodriquez, A., "Ronchi Test," Chapter 9. Decker, C., et al., "High-Speed Polymerization of Acrylate Monomers by UV Irradiation," pp. 487-488. Drebeta, P., et al., "Volume Phase Gratings in DMPA-Doped Polymers," Applied Physics A, Springer-Verlag 1994, 58, pp. 401-405. Dreβ, P., et al., "Volume Phase Gratings in DMPA-Doped Polymers," Applied Physics A, Springer-Verlag 1994, 58, pp. 401-405. Ducharme et al., Observation of the Photorefractive Effect in a Polymer, Physical Review Letters, Apr. 8, 1991, pp. 1846-1849, vol. 66, No. 14, American Physical Society. Duke-Elder et al., System of Ophthalmology -Ophthalmic Optics and Refraction, Chapters II & III, 1970, pp. 26-153, vol. V, Henry Kimpton, London. Fouassier, J.P., et al., "Photopolymers for laser imaging and holographic recording: design and reactivity of photosensitizers," Optical Engineering, Jan. 1996, vol. 35 No. 1; pp. 301-312. Fouassier, J.P., et al., "Visible Laser Lights in Photoinduced Polymerization. VI. Thioxanthones and Ketocoumarins as Photoinitiators," Journal of Applied Polymer. Science, 1992, vol. 44, pp. 1779-1786. Gedde, U.W., et al., "Sorption of Low Molar Mass Silicones in Silocone Elastomers," Polymer Engineering and Science, Aug. 1996, vol. 36, No. 16, pp. 2077-2086. Goodman, Introduction to Fourier Optics -Chapter 8/Wavefront-Reconstruction Imaging, or Holography, 1968, pp. 198-273, McGraw-Hill, Inc., USA. He, X.W., et al., "Chain Extension of alpha, omega-Dihydroxy Polydimethylsiloxane: Simulation of the Linear Polycondensation Reaction," Eur. Polym. J. vol. 27, No. 4/5, pp. 449-453, 1991. He, X.W., et al., "Competition Between Polycondensation of alpha,omega-Dihydroxy Polydimethylsiloxane and its Condensation with Alkoxy Silane: A Kinetic Approach," Eur. Polym. J. 1988; 24(12); pp. 1145-1148. He, X.W., et al., "Chain Extension of α, ω-Dihydroxy Polydimethylsiloxane: Simulation of the Linear Polycondensation Reaction," Eur. Polym. J. vol. 27, No. 4/5, pp. 449-453, 1991. He, X.W., et al., "Competition Between Polycondensation of α,ω-Dihydroxy Polydimethylsiloxane and its Condensation with Alkoxy Silane: A Kinetic Approach," Eur. Polym. J. 1988; 24(12); pp. 1145-1148. Holographic Optical Elements, National Technical Information Service Publication AD760561, Jan. 1973., 170 pages, U.S. Department of Commerce. Ingwall, R.T., et al., "Hologram recording with a new photopolymer system," Optical Engineering, Sep./Oct. 1985, vol. 24, No. 5, pp. 808-811. Ingwall, R.T., et al., "Mechanism of hologram formation in DMP-128 photopolymer," Optical Engineering, Jun. 1989 vol. 28, No. 6, pp. 586-591. Javitt et al., Outcomes of Cataract Extraction with Multifocal Intraocular Lens Implantation -Functional Status and Quality of Life; Ophthalmology; Apr. 1997; pp. 589-599; vol. 104; No. 4. Kippelen et al., New highly efficient photorefractive polymer composite for optical-storage and image-processing applications, Electronic Letters, Oct. 14, 1993, pp. 1873-1874, vol. 29, No. 21. Kloosterboer, J.G., "Network Formation by Chain Crosslinking Photopolymerization and its Applications in Electronics," Advances in Polymer Science 84, Springer-Verlag Berlin Heidelbery 1988, pp. 1-61. Kunzler, J.F., "Silicone Hydrogels for Contact Lens Application," Trends in Polymer Science 1996; 4; pp. 52-59. Kunzler, J.R.; Ozark, R., "Hydrogels Based on Hydrophilic Side-Chain Siloxanes," J. Appl. Poly. Sci. 1995; 55; 611-619. Lai, Y.C. ; Ozark, R.; Quinn, E.T., "Synthesis and Characterization of Alpha, Omega-Bis(4-hydroxybutyl) polydimethylsiloxanes,". J. Poly. Sci. A. Poly. Chem. 1995; 33; 1773-1782. Leaming, special report -Practice styles and preferences of ASCRS members -1997 survey. ; J. Cataract Refract. Surg. ; May 1997; pp. 527-535; vol. 23; ASCRS and ESCRS; Elsevier Science Inc.
Leaming, special report -Practice styles and preferences of ASCRS members -1999 survey. ; J. Cataract Refract. Surg. ; Jun. 2000; pp. 913-921; vol. 26; ASCRS and ESCRS; Elsevier Science Inc.
Levi, New Compound Brightens Outlook for Photorefractive Polymers, Physics Today, Jan. 1995, pp. 17-19, vol. 48, No. 1, American Institute of Physics. Liang et al., Objective measurement of wave aberrations of the human eye with the use of a Hartmann-Shack wave-front sensor, J. Optical Society of America, Jul. 1994, pp. 1949-1957, vol. 11, No. 7, Optical Society of America. Liang et al., Supernormal vision and high-resolution retinal imaging through adaptive optics, J. Optical Society of America, Nov. 1997, pp. 2884-2892, vol. 14, No. 1, Optical Society of America. Longhurst, R.S., "The General Geometrical Theory of Optical Systems," Geometrical and Physical Optics, 2nd Ed. Chapter 2, (Longman Group Ltd., London 1967), pp. 17-41. Longhurst, R.S., "The Monochromatic Aberrations," Geometrical and Physical Optics, 2nd Ed. Chapter 15, (Longman Group LTD., London 1967) pp. 340-354. Malacara-Doblado, D., "Measuring the curvature of spherical wavefronts with Talbot interferometry," Optical Engineering, vol. 36, No. 7, Jul. 1997, pp. 2016-2024. Manivannan, G., et al., "Trends in Holographic Recording Materials," TRIP, vol. 2, No. 8, Aug. 1994, pp. 284-290. Meerholz et al., A photorefractive polymer with high optical gain and diffraction efficiency near 100%, Letters to Nature, Oct. 6, 1994, pp. 497-500, vol. 371. Mendívil, Intraocular lens implantation through 3.2 versus 4.0 mm incisions; J. Cataract Refract. Surg. ; Dec. 1996; pp. 1461-1464; vol. 22; No. 10. Merker, R.L., et al., "The Copolymerization of Cyclic Siloxanes," J. Poly. Sci., vol. XLIII, 1960, pp. 297-310. Moerner et al., Photorefractive Polymers for Holographic Optical Storage, OSA Technical Digest Series, 1995, pp. 330-333, vol. 21. Moerner, W.E., et al., "Polymeric Photorefractive Materials," Chem. Rev. 1994; 94; pp. 127-155. Monroe, B.M., et al., Photoinitiators for Free-Radical-Initiated Photoimaging Systems,: American Chemical Society, 1993, 93, pp. 435-448. Nakano, Y., et al., "Talbot interferometry for measuring the focal length of a lens," Applied Optics, vol. 24, No. 19, Oct. 1985. Negishi et al., Evaluation of a Zonal-progressive Multifocal Intraocular Lens; American Journal of Ophthalmology; Sep. 1997; pp. 321-330; vol. 124; No. 3; American Journal of Ophthalmology. Olsen et al., Accuracy of the newer generation intraocular lens power calculation formulas in long and short eyes; J. Cataract Refract. Surg. ; Mar. 1991; pp. 187-193; vol. 17; No. 2. Olsen, Sources of error in intraocular lens power calculation; J. Cataract Refract. Surg. ; Mar. 1992; pp. 125-129; vol. 18; No. 2. Oshika et al., Three year prospective, randomized evaluation of intraocular lens implantation through 3.2 and 5.5 mm incisions, J. Cataract Refract. Surg. ; Apr. 1998; pp. 509-514; vol. 24. Oshika et al., Three year prospective, randomized evaluation of intraocular lens implantation through 3.2 and 5.5 mm incisions; J. Cataract Refract Surg. ; Apr. 1998; pp. 509-514; vol. 24. Pierro et al., Clinical variability in keratometry, ultrasound biometry measurements, and emmetropic intraocular lens power calculation; J. Cataract Refract. Surg. ; Jan. 1991; pp. 91-94; vol. 17; No. 1. Poga et al., High Efficiency Photorefractive Polymer with Immunity to Crystallization, OSA Technical Digest Series, 1995, pp. 342-344, vol. 21. Pouliquen, L., et al., "Functionalized Polysiloxanes with Thioxanthone Side Groups: A Study of Their Reactivity as Radical Polymerization Macroinitiators," .Am. Chem Soc., 1995 Macromolecules, 28, pp. 8028-8034. Ravalico et al., Postoperative Cellular Reaction on Various Intraocular Lens Materials; Ophthalmology; Jul. 1997; pp. 1084-1091; vol. 104; No. 7. Riffle, J.S., et al., "Elastomeric Polysiloxane Modifers for Epoxy Networks, Synthesis of Functional Oligomer and Netowrk formation Studies," Am. Chem. Soc., 1983, Chapter 2, pp. 21-54. Rigbi et al., Concurrent Chain Extension and Crosslinking of Hydroxyl-Terminated Poly(dimethyl siloxane): Possible Formation of Catenate Structures; Journal of Polymer Science: Polymer Physics Edition; 1986; pp. 443-449; vol. 24; John Wiley & Sons, Inc.
Rigbi, Z, "concurrent chain Bextension and Cross-Linking of Hydroxyl-Terminated Polydimethylsiloxane. Possible Formation of Catenate Structures," pp. 44-45. Sawhney, A.S. et al., "Bioerodible Hydrogels Based on Photopolymerized Poly(ethylene glycol)-co-poly(alpha-hydroxy acid) Diacrylate Macromers," Macromol. 1993; 26; pp. 581-587. Sawhney, A.S. et al., "Bioerodible Hydrogels Based on Photopolymerized Poly(ethylene glycol)-co-poly(α-hydroxy acid) Diacrylate Macromers," Macromol. 1993; 26; pp. 581-587. Smothers et al., Hologram Recording in Dupont's New Photopolymer Materials; IEE Conference Publication; 1989, pp. 184-189; vol. 311. Smothers et al., Photopolymers for holography; Practical Holography; 1990; pp. 20-29; vol. 1212; SPIE. Steinert et al., Long-term clinical results of AMO PhacoFlex model SI-18 intraocular-lens implantation. ; J. Cataract Refract. Surg. ; May 1995; pp. 331-338; vol. 21; No. 3. Su, Der-Chin, et al., "A new technique for measuring the effective focal length of a thick lens or a compound lens," Optics Communications, 1990, vol. 78, No. 2, pp. 118-. Tanabe, T., et al., "Visible Light Photopolymerization: Synthesis of New Fluorone Dyes and Photopolymerization of Acrylic Monomers Using Them," J. Poly. Sci. A. Poly. Chem. 1995; 33; pp. 1691-1703. Valdes-Aguilera, O., et al., "Photopolymerization Studies Using Visible Light Photoinitiators," Am. Chem. Soc., 1992, Macromolecules, 25, pp. 541-547. Yang, Z, et al., "Activity and Stability of Enzymes Incorporated into Acrylic Polymers," J. Am. Chem. Soc. 1995, 117, pp. 4843-4850. Yilgor, I.; Riffle, J.S. 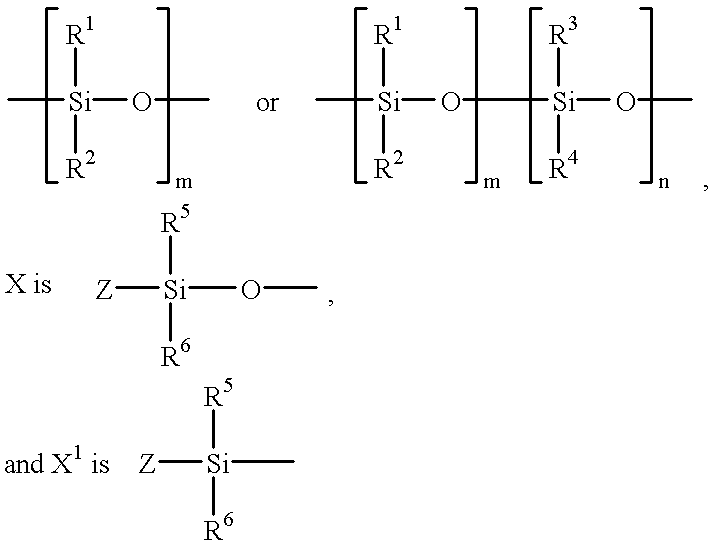 ; McGrath, J.D., "Reactive Difunctional Siloxane Oligomers Systhesis and Characterization," Am. Chem. Soc. 1985, Chapter 14, pp. 162-174. Yu, Q.; Andresen, K., "Fringe-orientation maps and fringe skeleton extraction by the two-dimensional derivative-sign binary-fringe method," Applied Optics, 1994; 33 (29); pp. 6873-6878. Zhang, Y., et al., "Photorefractive Polymers and Composites," Adv. Mater, 1996; 8(2); pp. 111-125. Zobel, O., et al., "A Polysiloxane-Based Photorefractive Polymer with High Optical Gain and Diffraction Efficiency," Adv. Mater. 1995; 7(11); pp. 911-914. ES2305109T3 (en) 2008-11-01 Power adjustment of an adjustable lens.